This unique book has wipe-clean pages to colour and recolour. 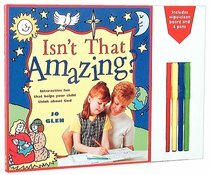 Packed with ideas for drawing and writing activities, it invites young minds to think and talk about God, creation, and the birth of Jesus. Each page in this amazing book is packed with fascinating facts about God's world and the people in it. As children read through the facts, they find suggestions on coloring and drawing pictures, filling in personal information and so much more. The accompanying wipe-off board and marker set make this a favorite for children of all ages.